“Shake it up, shake it up!”–Nope, it’s not just an awesome Florence+the Machine song, but a life philosophy–MY freaking life philosophy. So, where has my creative MoJo gone? I could blame classes, I could blame my internship aka cubicle nation, but I blame myself for not tapping into my creative side more often. I’m the girl who made her own Little Debbie’s costume and pranced around the Haymarket to shoot a fun commercial for a class project, the girl who made her own “Risky Business” remake video, and there’s nothing like taking videos when you’re dancing 14,000+ feet up in the mountains, but the bottom line is: me+ideas+camera=love. I had a much awaited realization this evening after hearing an interview between Christopher Kingsley of Roundus and Clint Runge and Charlie Hull of Archival–their name and businesses speak for themselves, but more importantly they thrive off making an impact and doing what they do pretty damn well. Back in February of this year, I listened to Clint and Charlie speak at the Nebraska Summit for Entrepreneurship about Nebraska’s image as being a flyover state and our national perception (i.e. nothing here, but corn fields, flat land, do we have electricity? )–these must be the same people who think their food grows in the back of the grocery store. This got me really fired up, Nebraska is a beautiful state and we have a lot to be proud of! Long story short, I was moved by this whole ordeal and two months later I got an internship with our State tourism division. Now, this is where I have to be careful. I like to rock the boat now and then, it only makes sense with my nature to shake things up and a state agency is not a place to do that–I’ve been pretty darn obedient. Nevertheless, as I sit in my office –the ideas start coming to me and sometimes I just have post-its of scribbles at the end of the day. I often daydream about flying to New Zealand and shooting videos on a whim, capturing unusual moments in life. I also think about throwing missiles (rubberbands) and wondering what cubicle they would land in and I’m tempted to stand on my chair to peek over the rest of cubicle dwelling nation. There’s a big part of me that likes to live on the edge. I’m not a fan of coasting through life, which is why one of Charlie’s comments struck a chord with me, it’s a good thing to be uncertain. Comfort zones are boring, shake something up. You should always question the status quo. Let your imagination run wild, then run with it. I’ve realized several things this past semester: I enjoy speaking to audiences, I get a this post presentation buzz , but there’s much room to improve. I love to both entertain friends and empower others. 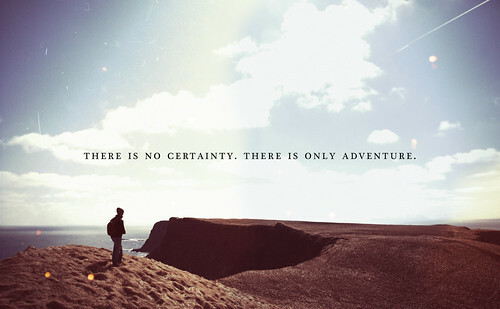 I want to travel, I will travel along with everything above that I believe are self fulfilling prophecies. There is a reoccurring pattern in my life that closely resemble self fulfilling prophecies. —A self-fulfilling prophecy is a prediction that directly or indirectly causes itself to become true, by the very terms of the prophecy itself, due to positive feedback between belief and behavior. It has almost been a year since I’ve been out of school. I’ve been too stubborn to even think about going back since recently. Now I think I would be holding myself back from a great experience if I don’t open my eyes and see there are doors of opportunity ready to be opened. I was just recently certified as a personal trainer, a dream that I’ve always had in the back of my head, and now it’s real. I work at a gym and I do what I love! But I would be lying to say that I’m content where I am at right now. There are so many things that I’ve dreamed of doing! There’s no way I can stop here. I can’t sit and wonder ‘what if?’ anymore. but let’s just say the whole college experience! College continues to develop and challenge me everyday. I’ve had some unforgettable experiences working with Outdoor Adventures, summer camp, joining the women’s ultimate frisbee team, landing my internship, and now I’m conquering my fear of public speaking one presenation at a time. Priceless relationships have been made over the past several years. I can’t tell you how determined I was, and how that little voice in the back of mind became reality, call it a self fulfilling prophecy, call it what you may. There’s a quote that states, “The greatest battles of life are fought out daily in the silent chambers of our own selves.” Overcome that with a simple concept–believe in yourself.